The concept of minimally invasive lumbar disc surgery comprises reduced muscle injury. The aim of this study was to evaluate creatine phosphokinase (CPK) in serum and the cross-sectional area (CSA) of the multifidus muscle on magnetic resonance imaging as indicators of muscle injury. We present the results of a double-blind randomized trial on patients with lumbar disc herniation, in which tubular discectomy and conventional microdiscectomy were compared. In 216 patients, CPK was measured before surgery and at day 1 after surgery. In 140 patients, the CSA of the multifidus muscle was measured at the affected disc level before surgery and at 1 year after surgery. The ratios (i.e. post surgery/pre surgery) of CPK and CSA were used as outcome measures. The multifidus atrophy was classified into three grades ranging from 0 (normal) to 3 (severe atrophy), and the difference between post and pre surgery was used as an outcome. Patients’ low-back pain scores on the visual analogue scale (VAS) were documented before surgery and at various moments during follow-up. Tubular discectomy compared with conventional microdiscectomy resulted in a nonsignificant difference in CPK ratio, although the CSA ratio was significantly lower in tubular discectomy. At 1 year, there was no difference in atrophy grade between both groups nor in the percentage of patients showing an increased atrophy grade (14% tubular vs. 18% conventional). 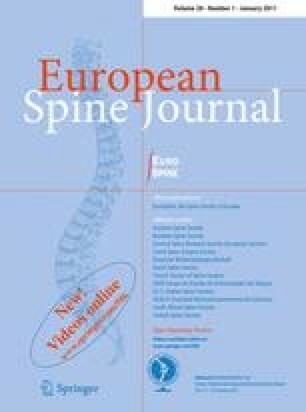 The postoperative low-back pain scores on the VAS improved in both groups, although the 1-year between-group mean difference of improvement was 3.5 mm (95% CI; 1.4–5.7 mm) in favour of conventional microdiscectomy. In conclusion, tubular discectomy compared with conventional microdiscectomy did not result in reduced muscle injury. Postoperative evaluation of CPK and the multifidus muscle showed similar results in both groups, although patients who underwent tubular discectomy reported more low-back pain during the first year after surgery. Unilateral transflaval microdiscectomy has become the standard surgical procedure for the treatment of patients with symptomatic lumbar disc herniation. Surgical outcome of sciatica is excellent in most cases although postoperative low-back pain may sustain, posssibly as a result of iatrogenic muscle devascularization and denervation . Therefore, peri operative muscle injury should be avoided as much as possible and, consequently, minimally invasive surgery has gained popularity. The rationale behind minimally invasive lumbar disc surgery is less muscle damage, less postoperative low-back pain, and faster recovery and resumption of daily activities, while achieving good clinical outcome. In 1997, Foley and Smith introduced the muscle-splitting technique of tubular discectomy for the treatment of lumbar disc herniation . Tubular discectomy has been proven safe and effective for the treatment of patients with lumbar disc-related sciatica. Muscle damage is quantified by an increase of creatine phosphokinase (CPK) in serum and reaches a maximal value on 1 day after surgery [8, 9]. A clear dose–response relationship between CPK and the extent of surgical invasiveness has been shown . Although the spinal procedures were subdivided according to the extent of surgery, tubular discectomy and conventional microdiscectomy were both classified as minimally invasive and no distinction was made. Previous studies reported lower CPK levels in patients treated with microendoscopic discectomy compared with patients who underwent conventional microdiscectomy. However, the number of patients studied was small and the length of skin incisions were not equal [15, 19]. Radiographic imaging has documented atrophy of the paravertebral muscles after spine surgery, although the results are conflicting [11, 13, 21, 22]. Motosuneya et al. have shown muscle atrophy after different spinal procedures and found a positive correlation between muscle atrophy and duration of surgery. Kotilainen et al. documented no difference in muscle volume after microdiscectomy and percutaneous nucleotomy. Magnetic resonance imaging (MRI) failed to show a difference in muscle injury after microendoscopic discectomy and conventional discectomy, although the cross-sectional area (CSA) of the paravertebral musculature was not measured . Recently, we reported the results of a double-blind randomized trial on tubular discectomy versus conventional microdiscectomy for the treatment of patients with lumbar disc herniation. There was no significantly difference in functional improvement as measured by the Roland Disability Questionnaire for sciatica (RDQ) during the first year after surgery, although tubular discectomy resulted in less favourable results for leg pain, low-back pain and perceived recovery . The purpose of the present study was to quantify the muscle injury in the aforementioned trial by analysing the within-patient relative change in CPK and CSA of the multifidus muscle in relation to the patient’s postoperative low-back pain score. Between January 2005 and October 2006, a double-blind randomized controlled trial among patients with sciatica due to lumbar disc herniation was conducted in seven general hospitals in the Netherlands. Details of the study design have been published previously . Briefly, patients (aged between 18 and 70 years) presenting with radicular pain due to lumbar disc herniation lasting more than 6–8 weeks were included. MRI confirmed disc herniation with distinct nerve root compression. A computer-generated permutated-block schedule was used for randomization, with patients stratified according to each hospital. Randomization was performed in the operating room by opening a sealed opaque envelope containing the assigned strategy. Patients and observers were blinded to the allocated treatment during the follow-up period. Surgery was performed under general or spinal anaesthesia with the patient in the prone position. The relevant disc level was verified fluoroscopically. An equally small (2–3 cm) midline incision was made in both techniques. Conventional microdiscectomy was performed after subperiosteal dissection of the ipsilateral paravertebral muscles. The herniated disc was removed by the unilateral transflaval approach with the aid of a headlight-loupe or microscope magnification, depending on the surgeon’s preference. In case of tubular discectomy, the skin was retracted laterally and the guidewire and sequential dilators (METRx, Medtronic) were placed at the inferior aspect of the lamina under fluoroscopic control. A 14–18 mm working channel was introduced over the final dilator and attached to the table. The herniated portion of the disc was removed through the tubular retractor with microscopic magnification. In both procedures, aggressive subtotal discectomy was never intended and bony removal was minimal, if necessary. During the postoperative period all patients were mobilized and discharged as soon as possible. All patients were stimulated to resume their regular activities whenever possible. Serum concentration of total CPK was measured before surgery (CPK1) and at day 1 after surgery (CPK2). Because of laboratory costs and logistic challenges, we decided only to perform CPK sampling in those three centers who recruited most patients. There were no significant differences in patients’ characteristics between this subgroup and the total population studied. The experienced low-back pain intensity was measured on a 100-mm visual analogue scale (VAS) varying from 0 mm, ‘no pain’, to 100 mm, ‘the worst pain imaginable’. Scores were documented before surgery and at 1, 2, 4, 6, 8, 12, 26, 38, and 52 weeks after surgery. Forms were filled out during clinical visits or sent by mail and patients were not aware of their earlier assessments. All participating patients underwent MRI of the lumbar spine before surgery. For financial reasons, the 1-year postoperative MRI could only be performed in those patients treated in the primary study centre. In accordance with the CPK sampling, there were no significant differences in patients’ characteristics between this subgroup and the total population studied. The MRI examinations were performed with images ranging from 0.5 to 1.5 Tesla. Standard sagittal and axial T1 and T2 images were acquired. The CSA of the multifidus muscle bulk (in mm²) was measured on the side and level of the herniated disc on T2 weighted axial MR images by one neuroradiologist who was unaware of the allocated treatment. The measure of the multifidus muscle bulk included intramuscular fat and fibrous tissue. Also, T1 weighted images after gadolinium administration were acquired at 1-year follow-up. Additionally, atrophy was graded on a scale of 0 (normal) to 3 (severe atrophy)  by another neuroradiologist, also blinded for the allocated treatment. Mild atrophy (grade 1) was defined as replacement of <10% of the multifidus muscle bulk with fat and fibrous tissue. Moderate atrophy (grade 2) was defined as replacement between 10 and 50% of the multifidus muscle bulk with fat and fibrous tissue. Severe atrophy (grade 3) was defined as replacement of more than 50% of the multifidus muscle bulk with fat and fibrous tissue. Finally, the neuroradiologists were asked which treatment was performed. This was based on the presence of post-operative changes such as epidural scar tissue, signs of laminotomy, signal changes in the intervertebral disc, and signal changes in the dorsal musculature. Both CPK1 and CPK2 are not normally distributed and slightly skewed; therefore, all analyses were performed on the log transforms of these variables. CSA1 and CSA2 are normally distributed. The variables of interest are the CPK ratio (CPK2/CPK1), which characterizes the within-patient relative change in CPK, and the CSA ratio (CSA2/CSA1), which characterizes the within-patient relative change in CSA of the multifidus muscle. The log transform of the CPK ratio is the difference of the log transform of the individual measurements, so the usual regression approaches measuring the treatment effect as a difference on the outcome scale apply naturally when the log transformed data are used. Since the CSA ratio is normally distributed, the usual regression approach is valid. Data are presented as means ± standard deviations. Statistical analysis was performed using the two-tailed Student t-test and statistical significance was set at the probability level of 0.05. Nonparametric correlations between log (CPK ratio) and postoperative low-back pain score, CSA ratio and postoperative low-back pain score, and multifidus atrophy grade and postoperative low-back pain were analysed using Spearman’s correlation coefficient (which obviously does not depend on the application of a log transform). The agreement between the suspected group membership according to the (blinded) neuroradiologist and the actual group to which the patient was randomized, was measured by Cohen’s Kappa. All analyses were performed according to the intention-to-treat principle. The overall difference over the entire 1-year period between the two treatment groups is evaluated within a mixed model, accounting for the repeated measurements data structure and providing a global test over follow-up time. A total of 325 patients with lumbar disc-related sciatica were randomized into tubular discectomy and unilateral transflaval microdiscectomy. In 216 patients, CPK blood sampling was performed and 140/216 underwent postoperative MRI evaluation. Baseline demographics in both treatment strategies were similar (Table 1). Blood loss, moment of mobilization, and hospital stay were similar for both groups, although the operation time of tubular discectomy was 12 min longer (P < 0.001; Table 2). The mean CPK1 was 105.8 ± 65.5 IU/l for tubular discectomy and 107.1 ± 59.8 IU/l for conventional microdiscectomy, and the mean CPK2 values for tubular discectomy and conventional microdiscectomy were 255.7 ± 209.8 IU/l and 268.1 ± 242.4 IU/l, respectively. There was no statistical significant difference between both treatment groups in the mean CPK ratio and the mean log (CPK ratio; Table 3). The mean preoperative CSA of the multifidus muscle was 832 ± 206 mm² in patients allocated to tubular discectomy and 817 ± 209 mm² for patients allocated to conventional microdiscectomy; the mean postoperative CSA of the two groups were 821 ± 238 mm² and 846 ± 229 mm², respectively. The CSA ratio in the tubular discectomy group compared with the conventional microdiscectomy group was significantly lower (0.99 ± 0.14 vs. 1.05 ± 0.19; P = 0.04). One year after surgery, the mean atrophy grade of the multifidus muscle was 1.22 ± 0.83 for tubular discectomy and 1.31 ± 0.78 for conventional microdiscectomy, which was not significantly different (Table 4). However, this is a comparison that does not adjust for the preoperative levels. It is shown that for all patients the postoperative score was either the same or one point higher. Hence, the change is simply characterized by the percentage of patients deteriorated: 14% in the tubular discectomy group versus 18% in the conventional microdiscectomy group (P = 0.64). Based on the postoperative MRI findings, the (blinded) neuroradiologist predicted the correct allocated surgical strategy in 65% of all cases. The kappa measurement of agreement was 0.30. In all cases where the neuroradiologist disagreed with the actual randomization (49 patients), the disagreement was quite balanced: 22 versus 27 (27 times guessing conventional while it was actually tubular). This slight unbalance is not significant (McNemar test; P = 0.66). Interestingly, the prediction of the treatment by the (blinded) neuroradiologist was not correlated with either the CSA ratio nor the atrophy difference. In both treatment groups, the mean VAS scores for low-back pain improved during the first year after surgery. The 1-year between-group mean difference in improvement was 3.5 mm (95% CI; 1.4–5.7 mm) in favour of conventional microdiscectomy (Fig. 1). When studying the correlation of VAS scores for low-back pain with log (CPK ratio), VAS low-back pain with CSA ratio, and VAS low-back pain with multifidus atrophy grade, the non-parametric correlation coefficients were estimated to be very small and non-significant (Spearman’s correlation coefficient 0.042, −0.12, and −0.23, respectively). It has been argued that the muscle splitting technique of tubular discectomy might be set to replace the subperiosteal muscle dissection of the conventional open discectomy . Minimally invasive surgery is theoretically expected to reduce tissue damage and lead to less low-back pain, shorter hospitalization and a faster resumption of daily activities. However, the use of tubular discectomy compared with conventional microdiscectomy has not been shown to result in statistically better functional improvement, but, instead, in less favourable outcomes for leg pain, low-back pain, and perceived recovery . The current study documented quantitative analyses of muscle injury, measured by serum CPK and imaging of the multifidus muscle on MRI. No significant differences in CPK ratio and postoperative multifidus atrophy grade were found between tubular discectomy and conventional microdiscectomy although the CSA ratio was significantly higher in conventional microdiscectomy. The discrepancy between the results of grading the multifidus atrophy and measuring the CSA of the multifidus could be explained by the fact that replacement of the muscle bulk with fat and fibrous tissue was not taken into account when calculating the CSA. In addition, measurement errors contributing to the various assessment procedures or different individual responses for CSA changes and atrophy grades could explain the rather incompatible group mean findings. Interestingly, the neuroradiologist, who was unaware of the performed approach, was able to predict the allocated surgical treatment on postoperative MRI in 65% of the cases. However, no correlation between the predicted treatment and the CSA ratio or the atrophy grade was shown. Previous studies have reported on postoperative CPK levels in patients treated with tubular discectomy and conventional discectomy with conflicting results [18, 19]. The discrepancy between data might be attributable to the timing of serum sampling. Kawaguchi et al. have shown that serum level of CPK reaches a maximal value 1 day after surgery. However, Shin et al. reported no significant difference in serum levels of CPK at day 1 compared with preoperatively, but showed the CPK peak after 3 days. Also, differences in length of skin incision might be responsible for controversal results. Double-blind trials with equal length of skin incision are the highest level of scientific evidence and make the present study powerful and unique. Reports on postoperative low-back pain in relation to muscle denervation and atrophy have been published before, which emphasized the importance of limitted muscle injury in every surgical procedure [12, 20]. Motosuneya et al. have shown comparable degree of muscle atrophy after various surgical procedures, ranging from anterior interbody fusion to conventional microdiscectomy. However, Suwa et al. documented significant decrease of paraspinal muscle thickness after posterolateral fusion compared with interlaminar decompression. In patients treated with microdiscectomy or percutaneous nucleotomy, the CSA of the multifidus and erector spinae muscles remained unchanged . In our study, we measured the CSA of the multifidus muscle only and found similar results between tubular discectomy and conventional microdiscectomy, indicating no difference in muscle atrophy 1 year postoperatively. This is in accordance with the observation of Muramatsu et al. who showed no difference in post-operative contrast enhancement as a marker of tissue damage between tubular discectomy and conventional microdiscectomy. Our trial revealed evidence that patients treated with tubular discectomy or conventional microdiscectomy were fully recovered after a mean period of 2 weeks, irrespective of the assigned surgical treatment . That the muscle-splitting technique of the tubular retractor system is less invasive than subperiosteal detachment of the muscle from the spinous process must therefore be disputed. Manipulation and proper placement of the guidewire and sequential dilators during tubular approaches might disrupt the longitudinal muscle fibres even more than sharp incision and detaching the lumbosacral fascia from the spinous process during conventional procedures. This could explain the higher low-back pain scores in patients treated with tubular discectomy. However, the differences in pain scores were small and did not reach the minimal clinically important difference [5, 16]. The duration of surgery is an important contributing factor in muscle injury, irrespective of the type of surgical procedure [2, 4, 13]. The present study has shown significantly longer operation time of tubular discectomy compared with conventional microsurgery. The reduced muscle injury effect of minimally invasive tubular discectomy might be compensated by the release of CPK in serum due to longer operation time. To our knowledge, this is first study focussed on both CPK measurement and paravertebral muscle atrophy in relation to postoperative low-back pain. The prospective randomized trial on lumbar disc surgery by Kotil et al. has shown a relationship between muscle injury and retraction and relaxation time. The groups in which the retractor was released every 15 min resulted in the lowest CPK value and the least amount of low-back pain during 6-month follow-up . In accordance, Shin et al. showed significantly lower CPK and low-back pain scores in patients treated with microendoscopic discectomy compared with microscopic discectomy, but their observation period was restricted to 5 days postoperative. Neither of these studies reported correlations between CPK and VAS scores of low-back pain. Interestingly, our data on different surgical treatments of lumbar disc-related sciatica documented relief of low-back pain as well as leg pain. This is confirmed by others and could partially be explained by the favourable natural course of disc-related low-back pain . Regarding outcome of low-back pain, in daily practice these findings should be mentioned during preoperative counseling between patients and surgeons. The main limitation of our study is the lack of CPK measurement and performance of postoperative MRI in all randomized patients. Because of radiographic and laboratory costs, unfamiliarity of nurses when to obtain blood sampling, logistic challenges and additional patient load, we decided only to perform CPK sampling and postoperative MRI in those participating centres who recruited most patients. Nevertheless, the total number of evaluated patients is substantial. Second, there is no clinical evaluation of direct postoperative low-back pain during the first days after surgery. However, differences in short-term low-back pain scores seem unlikely since the skin incisions were equal and postoperative CPK measurement were similar in both groups. Finally, our data are limitted by the fact that the total CSA of the multifidus muscle was measured on MRI without correction of fatty degenerative changes within the muscle bundle. However, the impact of this limitation is minor since the atrophy grade is also documented and no correlations between multifidus CSA/atrophy grade and low-back pain scores are shown. The present data might change the daily practice of surgeons who perform tubular discectomy as standard surgical procedure in patients with herniated disc-related sciatica. Tubular discectomy was not found to be superior to conventional microdiscectomy, and the present assessment of muscle injury showed similar results for both groups. Therefore, in our opinion, the decision making of surgical strategy should be based on the preferences of patients and surgeons, bearing in mind the similar clinical outcome with no difference in muscle injury. Tubular discectomy is equally invasive as conventional microdiscectomy in terms of CPK and multifidus muscle atrophy. However, patients treated with tubular discectomy reported more low-back pain during the first year after surgery as those who underwent conventional microdiscectomy although the differences were small and not clinically relevant. The trial was funded by the Dutch Health Care Insurance Board (College Voor Zorgverzekeringen). We want to thank the research nurses and datamanager of the Spine Intervention Prognostic Study Group (SIPS) for their work in making this trial possible. The authors do not have any financial interest in any of the materials used in the present study.